Ernest Gimson. 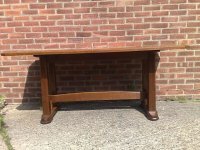 A rare and important Cotswold school walnut gate leg table. The design for this table attached here is held in the Cheltenham Trust Borough Council's Archives. Ernest Gimson & Sidney Barnsley Archive, No. 1941.22.393, inscribed Folding Tea. H 27", W 38" Open, W 13" Closed. H 42", W 21", D 25.5". 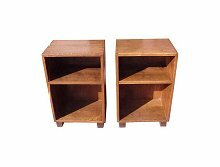 A pair of Cotswold Arts and Crafts oak bed side table/bookcases with exposed dovetail construction on sledge style feet attributed to Edward Barnsley, 1 stamped 45 the other 32 to the under tier. A high quality hand crafted oak and rush seated double stool probably made by Edward Gardiner with incised marking lines to the legs for precise measuring of the joints. All pegged joints with with hand cut oak U supports to the underneath and an extra stretcher to the upper middle for added strength. H 16', D 15 1/2', L 54 3/4'. 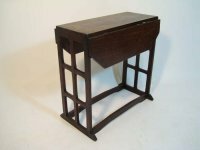 Cotswold School Arts and Crafts two tier walnut craftsman made side table with arch supports and through tennon details, on sledge style feet. 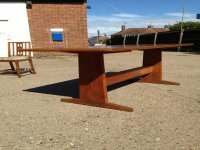 Arts and Crafts oak refectory table made by Peter Waals, with high stretcher and chamfered through tennons and shaped tapering feet. 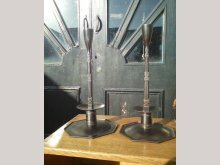 For similar examples see 'Modern British Furniture' page 179 and 'The Studio Year Book 1928. Length 6' Width 27 1/2". Circa 1900. 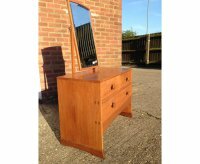 A little Arts and Crafts Cotswold School craftsman made dressing table, with through tennon and exposed dovetail details on seldge style feet, attributed to Edward Barnsley. Height 53", Width 33 1/2", Depth 17". 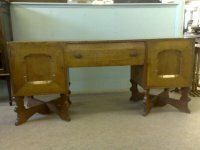 An Arts and Crafts Cotswold School craftsman made oak low sideboard. Height 27 3/4", Width 54" Depth 21 3/4". Circa 1900. 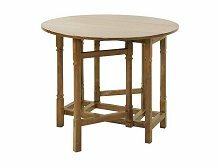 Arts and Crafts Cotswold School drop leaf dining table with lattice work ends and exposed tennons to the top the legs united by twin floor stretchers. Height 24", Width closed 10", Width open 23 1/2". Circa 1900. 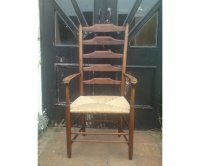 Three Arts and Crafts Cotswold School ladder back armchairs called 'The Clisset' made by Edward Gardner, one is stamped on the inside leg. With scribed legs and dowelled at each joint. One has had some damage to the right side of the ladders but has been repaired well (Images attached). FAR LEFT NOW SOLD. 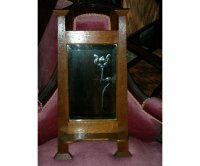 A small Arts and Crafts wall mirror with bevelled stylised flower to the glass and small lower shelf. Height 22", Width at base 12 1/2". Circa 1905. 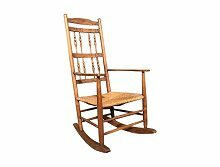 Arts and Crafts Cotswold School oak rocking chair with newly laid rush seat. 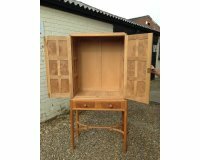 Height 40.5", Seat Height 16", Width 23", Depth 28.5"
A Cotswold School hanging corner cabinet Romney Green. Ernest Barnsley. 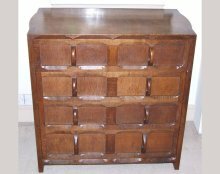 A highly important Cotswold School oak chest of drawers made around 1902 during the short period of his partnership with Ernest Gimson at Daneway. 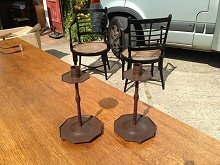 A pair of Armchairs designed by Ernest Gimson and made by Edward Gardener. 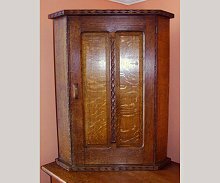 A Walnut corner cupboard the original design by Ernest Gimson and Sidney Barnsley. Although this is superb quality I feel it is not quite up to the quality that Gimson and Barnsley were producing at the turn of the century and therefore later somewhere before the 1920's. There is a photograph of an oak version on page 99, fig 64 of 'Gimson and the Barnsleys' by Mary Greensted 1980, (it is situated behind the white ladder back chair images). For a later rendition which is in Lotherton Hall. See also Gilbert, Christopher 'Furniture at Temple Newsam House and Lotherton Hall', vol I, London 1978, p. 59, no. 41, illustrated with the design sketch. This version of 1903 is in oak and was purchased by Henry H. Peach, Dryad Works, Leicester in 1915. Height 78 1/2" 200cm, Depth from back along each side 22" 55cm, Width 39" 98cm. 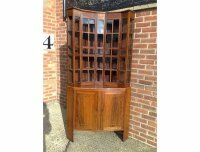 A top quality Cotswold School oak and burr walnut cabinet on stand. Height 68 3/4" Depth 16 1/4" Width 33 1/4". Circa 1900. An Arts and Crafts oak sideboard by Romney Green. Height 31", Depth 20", Length 70". Circa 1900. 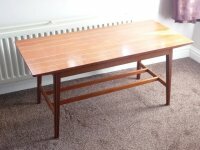 An Arts and Crafts style coffee table by The Barnsey Workshops. With bold use of timber and made with exposed joints, through tenons and foxwedges. Stamped Barnsley. 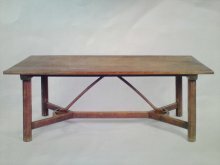 A superb quality chunky Arts and Crafts Oak eight-seat 'Tretower' refectory dining table designed by Paul Matt who was the key figure in the design and manufacture of Brynmawr Furniture, son of a German cabinet maker (who had made furniture to the designs of Charles Rennie Mackintosh), Matt served his apprenticeship with his father. He arrived in Brynmawr in 1929, keen to help in the Quaker project however he could. He set up the furniture workshop early in 1930. 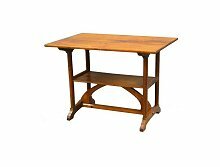 What is revealed by his designs for Brynmawr furniture is his knowledge of The Arts and Crafts movement, and continental Modernism, combined with a very practical approach to the materials, facilities and labour available. 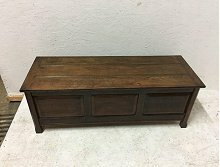 This is a pure hand craftsman built table. An Arts and Crafts oak blanket chest by Reynolds of Ludlow. Hand picked quarter sawn oak giving beautiful grain figuring to the top, with a chestnut lined interior to keep the moths away. 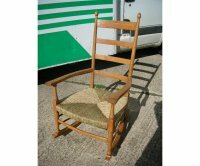 A great size to perfectly sit at the end of a double bed or where ever suits. 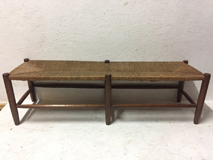 Has a lot of storage space and the perfect height to sit upon to pull your slippers on. Height 17” Depth 17 3/4” Width 48 3/4.